...just the second time this year. The latest AAII Sentiment Survey also shows a large drop in optimism and a decrease in the percentage of investors describing their outlook as neutral. Bullish sentiment, expectations that stock prices will rise over the next six months, plunged 10.3 percentage points to 28.4%. The drop puts bullish sentiment below its historical average of 38.5%. Neutral sentiment, expectations that stock prices will stay essentially unchanged over the next six months, fell by 4.4 percentage points to 30.7%. This is the lowest reading since 14th February 2018 (30.1%). 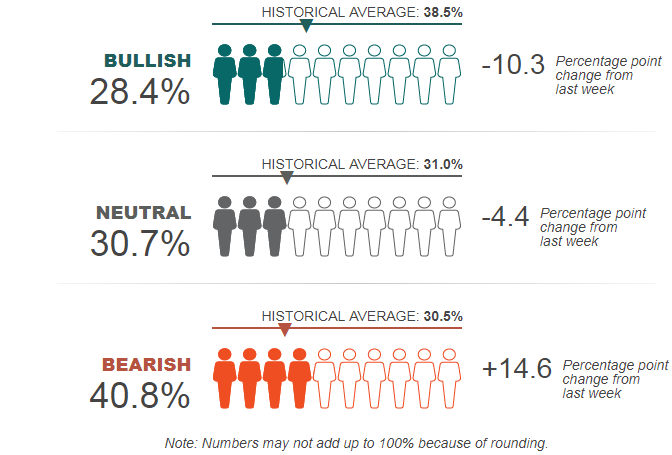 Nonetheless, neutral sentiment remains above its historical average of 31.0% for the 19th consecutive week. Bearish sentiment, expectations that stock prices will fall over the next six months, surged 14.6 percentage points to 40.8%. The rise ends a streak of 10 consecutive weekly readings below the historical average of 30.5%. At its current level, pessimism is unusually high (more than one standard deviation above its historical average). Historically, the six-month returns for the S&P 500 index have only been slightly above their historical average following such readings.